Abstract: The fundamental limits of optical information processing — be it the maximum rate of reliable communications, resolution of an optical imager, or the computational power of an optical computer — are ultimately governed by the laws of quantum mechanics. Most conventional systems, which do not exploit the manifestly quantum effects of light, are limited to performance inferior to these limits. In this talk, I will discuss a few simple illustrative problems in active and passive optical imaging, where exploiting quantum effects — either by using quantum illumination of the scene, or by employing non-standard all-optical pre-detection processing locally at the receiver (or both) — can yield improved performance over a classical imager that uses the same transmit power and optical bandwidth. I will discuss general characteristics of imaging scenarios where quantum improvements can be expected to be had, and the respective natures of enhancements in imaging performance. I will conclude with some theoretical open problems and photonic-device challenges that will need addressing to realize the aforesaid enhancements. Biography: Saikat Guha is a Lead Scientist with the Quantum Information Processing group at Raytheon BBN Technologies (BBN). 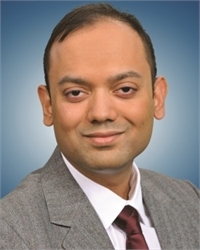 He received his Bachelor of Technology degree from the Indian Institute of Technology (IIT) Kanpur in 2002, and his Masters and Ph.D. degrees from the department of Electrical Engineering and Computer Science (EECS), Massachusetts Institute of Technology (MIT) in 2004 and 2008 respectively. Saikat represented the Indian team at the International Physics Olympiad in 1998, where he received the European Physical Society (EPS) award. He leads several projects, funded by DARPA, ONR, NSF, DoE, and ARL, on topics surrounding fundamental limits of photonic information processing, with applications to optical communications, sensing and computation. He received the Raytheon 2011 Excellence in Engineering and Technology Award, Raytheon's highest technical honor, for work his team did on the DARPA-funded Information in a Photon program. He was a co-recipient of an honorable mention in NSA's 2016 Cybersecurity Best Paper Award for his work on Quantum-Secured Covert Communications.